Things shift to Kansas City as the MIAA Men’s Basketball Tournament moves into the quarterfinal round. The quarterfinal round gets underway at 12 noon on Friday, March 4 from Municipal Auditorium in Kansas City, Mo. Third seed Missouri Southern will begin the quarterfinal round with a 12 noon tip against 11th seed Missouri Western. 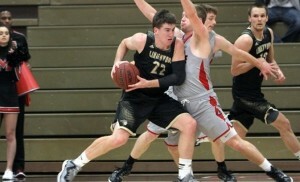 The Lions earned the bye to Kansas City, Missouri Western advanced to KC with a 70-54 victory over sixth seed Washburn. The Lions are led by Taevaunn Prince who is averaging a double-double with 26.6 points and 10.1 rebounds per game. Charlie Brown is averaging 14.6 points and Austin Wright 12.8 points per game. Entering the weekend MSSU is averaging 84.0 points while they allow opponents 79.4 points per contest. Trey Sampson leads the way for the Griffons averaging 11.6 points while Aaron Emmanuel adds 10.9 points per game. Emmanuel leads the way on the glass averaging 5.7 rebounds while Kevin Thomas also adds 5.7 boards per contest. After one game of tournament play Missouri Western is averaging 71.7 points and allowing opponents 75.3 points per game. The winner will advance to face the winner of #2 Nebraska-Kearney and #7 Lincoln at 6 p.m. on Saturday, March 5. Second seeded Nebraska-Kearney will face off with seventh seeded Lincoln in the 2:15 p.m. quarterfinal. The Lopers earned their way to Kansas City with a top four seed while the Blue Tigers advances with a 73-71 win over Emporia State. The Lopers are led by Connor Beranek who is averaging 24.3 points and a team best 8.3 rebounds per game. Trey Lansman is averaging 16.5 points while Ethan Brozek is averaging 13.6 points and 3.6 assists per game. Entering the tournament UNK is averaging 79.3 points while allowing their competitors 73.9 points per contest. For the Blue Tigers Anthony Virdure is averaging 21.7 points and Jaylon Smith is averaging 18.0 points per contest. Richie Lewis is averaging a team best 4.1 assists while on the glass Tacourrus Mattox is averaging 4.4 rebounds per contest. After one game in the tournament LU is averaging 77.9 points while allowing opponents 76.5 points per game. The winner will advance to face the winner of #3 Missouri Southern and #11 Missouri Western at 6 p.m. on Saturday, March 5. Top seeded Northwest Missouri will open the second session of the day at 6 p.m. by taking on ninth seed Lindenwood. The Bearcats earned the top overall seed while the Lions advanced with a 77-68 victory over Pittsburg State. For the Bearcats Justin Pitts is leading the way averaging 20.9 points and dishing out a team high 4.8 assists per game. Conner Crooker is averaging 12.9 points while Zach Schneider and Chris-Ebou Ndow are averaging 10.3 points per contest. Entering the weekend NWMSU is averaging 76.4 points while allowing the opposition 66.1 points per game. The Lions are led by Cory Arentsen who is averaging 23.8 points per game while Brad Newman averaging 11.8 points and 3.0 assists per game. Stanislas Heili is leading the team on the glass averaging 8.0 rebounds per contest. After their first tournament game LWU is averaging 69.0 points while allowing 65.6 points per contest. The winner will advance to face the winner of #4 Fort Hays State and #5 Central Oklahoma at 8:15 p.m. on Saturday, March 5 from Municipal Auditorium in Kansas City, Mo. Fourth seeded Fort Hays State will close out the evening session with an 8:15 quarterfinal match-up with fifth seed Central Oklahoma. The Tigers earned their spot in KC with a top four finish while Central Oklahoma advanced with a 94-74 win over Central Missouri. The Tigers are led by Rob Davis who is averaging 17.4 points and Dom Samac who is averaging 13.8 points and 7.0 rebounds per game. Craig Nicholson is averaging 11.7 points and a team best 4.7 assists while Jake Stoppel is averaging 11.0 points per game. Entering the tournament FHSU is averaging 77.0 points while allowing opponents 73.6 points per game. The Bronchos are led by Cornell Neal who is averaging 13.4 points and a team best 3.9 assists per game. Garen Wright is averaging 10.9 points while Trai Jordan leads the way on the glass with 6.2 rebounds per game. After one game of tournament play UCO is averaging 75.6 points while allowing their competitors 74.8 points per contest. The winner will advance to face the winner of #1 Northwest Missouri and #9 Lindenwood at 8:15 p.m. on Saturday, March 5. The MIAA Women’s Basketball Tournament moves into the quarterfinal round. The quarterfinal round gets underway at 12 noon on Thursday, March 3 also from Municipal Auditorium in Kansas City, Mo. Third seed Fort Hays State will open up the quarterfinal round with a 12 noon tip-off against sixth seeded Missouri Southern. 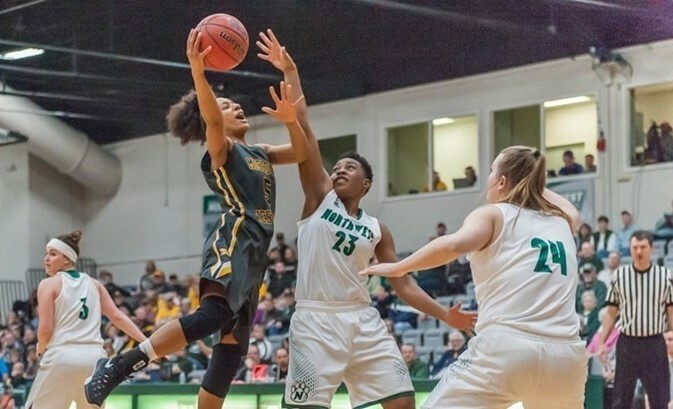 While the Tigers earned a bye into the quarterfinal Missouri Southern advanced in the first round with a 73-55 victory over Northeastern State. The Tigers are led by Chelsea Mason with 13.3 points and Jill Faxon with 12.2 points and a team best 5.4 rebounds per game per game. Beth Bohuslavsky is averaging 11.5 points and 3.0 assists while Paige Lunsford is averaging 10.9 points per contest. The Tigers enter the weekend averaging 71.6 points per game on offense while allowing opponents 59.9 points per game. For the Lions Sharese Jones is leading the way averaging 17.1 points and a team best 6.3 rebounds per game. Deb Holcomb is averaging 15.5 points while Kenya Wilson-Brown is dishing out a team high 4.1 assists per game. After the first round the Lions are averaging 64.8 points per game and allowing 60.3 points to their opponents. The winner will advance to face the winner of #2 Pittsburg State and #10 Central Missouri at 12 noon on Saturday, March 5. Second seeded Pittsburg State will play game two of quarterfinal Thursday at 2:15 p.m. against #10 seed Central Missouri. Pittsburg State earned the bye to Kansas City and Central Missouri advanced to KC with a 71-56 victory over Washburn. The Gorillas are led by Mikaela Burgess who is averaging 18.1 points per game and has 83 three-pointers on the season. Kyle Gafford is averaging 13.7 points and a team best 5.8 rebounds per game while Cathy Brugman averages 12.4 points per game. The Gorillas enter the tourney averaging 74.6 points per game while allowing opponents 63.1 points. For the Jennies Shelby Winkelmann is leading the way averaging 19.8 points and a team best 3.3 assists per game. Ashley Jones is averaging 12.1 points and leading the way on the glass with 8.8 rebounds per contest. After one game in the tournament UCM is averaging 67.5 points while allowing opponents 69.0 points per contest. The winner will advance to face the winner of #3 Fort Hays State and #6 Missouri Southern at 12 noon on Saturday, March 5. Top seeded Missouri Western will open the evening session on quarterfinal Thursday at 6 p.m. as they face off with the eighth seed Nebraska-Kearney. The Griffons earned the top overall seed in the MIAA Tournament while the Lopers defeated ninth seed Southwest Baptist 75-46 to earn their way to Kansas City. The Griffons are led by LaQuinta Jefferson who is averaging 21.9 points and 4.5 rebounds per game. Sarafina Handy is averaging 14.4 points and Miliakere Koyamainavure is averaging 12.0 points and 5.7 rebounds per game. Entering the tourney MWSU is averaging 83.1 points per game while allowing their opponents 63.3 points. Laramey Becker is leading the way for the Lopers averaging 15.8 points and a team best 5.4 rebounds per game. McKenzie Brown is averaging 10.0 points while Alexa Hogberg is dishing out a team high 4.2 assists per game. After one round in the tournament UNK is averaging 67.5 points while allowing opponents 63.2 points per game this season. The winner will advance to face the winner of #4 Emporia State and #5 Central Oklahoma at 2:15 p.m. on Saturday, March 5. Fourth seeded Emporia State will close out the first day of quarterfinals at 8:15 p.m. in a match-up with fifth seeded Central Oklahoma. The Lady Hornets earned the final bye to Kansas City while the Bronchos used a 71-56 victory over 12th seeded LIndenwood to earn the trip. For the Lady Hornets Kelly Moten is leading the way averaging 16.1 points and a team best 4.8 assists per game. Sandra Ngoie is averaging 12.6 points, Kelsey Barnwell added 10.4 and Kathryn Flott is averaging 10.3 points and a team high 8.6 rebounds per contest. Coming into the MIAA tournament ESU is averaging 78.2 points per game while allowing opponents 60.2 points. The Bronchos are led by McKenzie Solberg who is averaging 16.1 points and Julia Mason who adds 10.6 points per game. On the glass Olivia Mason is averaging 5.7 rebounds per game while Jordan Ward dishes out 3.6 assists per contest. After one game in the tournament UCO is averaging 70.6 points while allowing opponents 64.9 points per game. The winner will advance to face the winner of #1 Missouri Western and #8 Nebraska-Kearney at 2:15 p.m. on Saturday, March 5.